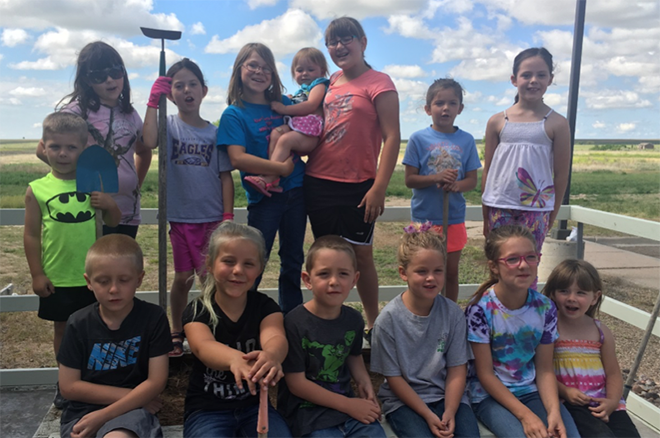 Saturday, June 3rd, the Kiowa County 4-H Cloverbuds, led by Gloria Trosper, met at Prairie Pines for a planting event! Weeks prior Kiowa County Extension Agent, Jeramy McNeely, met with Tina Kraft, Prairie Pines Administrator and discussed the possibility of adding a raised garden that the residents might enjoy. Not long afterward Kip Peck stepped up and volunteered to donate the wood for this large project, and Jeramy spent his afternoons putting it together out at the fairgrounds. Then this past Saturday Gloria, assisted by Raelynn Riley, and a clan of Cloverbuds, showed up with rakes and shovels, buckets and soil, and the work began. With many hands helping it didn't take long to fill the large container with soil, and soon after a garden was born! There are now loads of budding tomatoes, bell peppers, cabbage, zucchini, beats, squash and even several varieties of fruit. After planting the kids then helped pull weeds from the many rock beds out front.